‘Tis the season for trying new things, and the group of writers behind the online publishing collective Book View Cafe are doing just that, releasing their first eBook anthology of original fiction: The Shadow Conspiracy, a collection of related tales taking place in an alternate, steampunk world. What does it take to build up a home-cooked anthology and give it the depth and quality that these authors, professional writers all, expect and demand of their work? The Shadow Conspiracy editor Laura Anne Gilman is here to show you all the gears in this steampunk world. 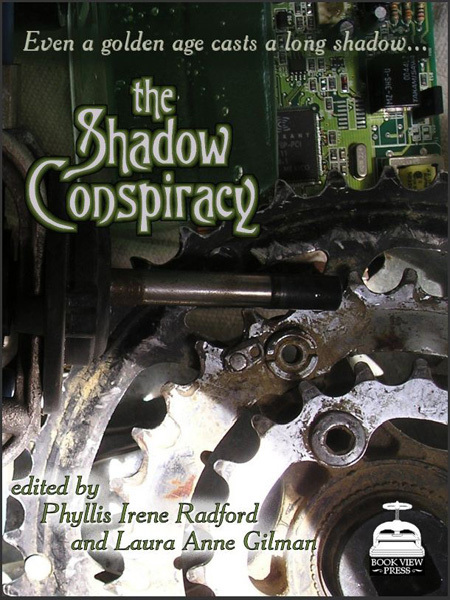 The Shadow Conspiracy, a steampunk ebook anthology launching this month, started, not in the usual “hey, here’s a great idea” moment most anthologies lay claim to, but as a natural evolution of BookView Café. BookView Café is a co-op of professional writers, using our collected skills — not merely writing, but editing, and coding, and promotion and design –to bring our fiction directly to the readers, using the Internet as our medium. The emphasis, however, is on professional-level work, with every member bringing an established career to the mix. BVC started with free reprints – short stories, novels, cartoons, interactive fiction – then offered for-premium original material… and then, as we reached our year anniversary, we thought: why not try an original anthology? Not a standard collection of stories, but something that represented what we’re doing here at BVC — the evolving, interactive, creative nature of our co-op. The idea had to be one that could inspire all the writers — something that spoke to us all, that would be fun to write — but that we could also put a new twist into it. Steampunk, everyone agreed, was the obvious answer. Not because it was hot, but because it, like Bookview Cafe, defied a single definition. It called on music, and fashion, exploration and science, design, religion, and desire… speaking to every writer differently, yet keeping us within the overarching theme of progress. The Shadow Conspiracy was thus born out of a desire to see what could be accomplished by a true collective, everyone working both for their own good — every author makes money off the sales – and as a group, weaving their stories in and out of a shared reality. Having edited two anthologies myself, and acquired many more during my editorial days, I was probably the Official Naysayer in this project. I warned about the difficulties of getting everyone on the same page, of the time constraints and technical difficulties, and the ego conflicts that were bound to appear when asking everyone to ‘share’ their concepts and make sure that no story, however brilliant, undid or contradicted the work of another. Despite my naysaying – or, more likely, because of it – I was asked to stand as editor-in-chief for this new project, working with Phyllis Radford, who was the overall project editor. Despite the enthusiasm for the idea, getting everything in order wasn’t easy. Editing an anthology is compared to herding cats for a reason; everyone had their own ideas, and their own takes on the history. Our job, as editors, was to take all those views, and make them into a non-contradicting whole, without taking away from the uniqueness of each entry. All of my worst fears were realized – and then put to rest, as everyone stepped forward with their best game, and their most professional attitude, giving us not only fabulous and wildly inventive stories – but working with each other to ensure that the continuity was logical, if not always marching in lockstep. And, in the end, I’m proud and pleased to say that The Shadow Conspiracy, our first all-original anthology, is true to the nature of Book View Cafe: individual creativity, harnessed to a greater goal. Read an excerpt here. Visit Laura Anne Gilman’s LiveJournal. ebook-ONLY? Lame. The book looks good, though, so I’ll be getting it. Sounds interesting. I know that the e-book format is part of the point to them but…. I kinda hope they publish it on paper one day. I like having things on my shelves. And, believe me, I appreciate the love of paper books. The problem is they are much more expensive and difficult to produce and distribute, even with services like Lulu available. So, for now while we’re getting started, we have to concentrate on ebooks. We hope one day to expand out into hard copies. So, can’t a book like this become a POD book off of Amazon without too much trouble? For Tumbleweed. 4) …and for MEEEEE! Looks like great stuff, but I’m a Luddite outside the office, and I know the good folks here don’t want me reading fiction on work time. Unenlightened of them, yes, but there it is. Ooooh- authors I like and a cool theme. [adds to ‘buy soon’ list. Fun! I loved those Thieves World and Borderlands collaborative anthologies that were the cool thing in the 80s. Remember those? There’s nothing lame about experimenting. And hey, it’s available in multiple formats. Supporting a company that offers that is worth it if you’ve got a mobile reader. #Tumbleweed — as Sarah said, we’re working the ebook side of things right now, but that’s not to say it’s the ONLY side. There are a number of format possibilities being discussed for the long term. Does buying direct give BookView Café a bigger cut? I have a Kindle and love the whispernet, but don’t mind sideloading with the USB, epecially if you sell it unencrypted. Actually, if you sell it unencrypted, that will probably make the descision for me. Sold! As soon as I can get home where I feel okay entering CC#’s. Jen & Laura: This reminded me of the Thieves World books too, which I loved. Plus they taught me the meaning of the word “vivisection.” Shadow Conspiracy sounds like a good read. Got it last night (through you:) ). Haven’t had the time to sit down with it, but looking forward to it. Interesting. Looks shiny. As long as there’s a PDF, its electronic-only nature is dealable — at worst, your local copy shop can turn it into a physical object for not too much money.